Spearheading advocacy and public policy in Arizona is part of AzAEYC’s mission! Early childhood professionals understand the importance of quality early childhood education programs and the lasting impact that a good start in life provides for all young children. Learn more about the issues that affect young children and their families – and the early childhood workforce. Consider contacting those who shape state and national policy at local, state, and federal levels. Register to vote! Our voices count. 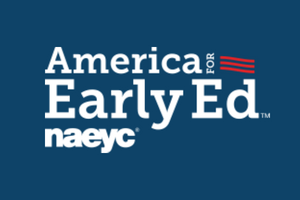 NAEYC launched Early Ed for President, our first non-partisan electoral advocacy campaign. America for Early Ed continues that successful initiative. With a commitment to expanding opportunity, supporting excellence and equity, and valuing early childhood educators, America for Early Ed serves as a mobilizing hub to ensure that candidates and policymakers from both sides of the aisle embrace early learning as essential. AzAEYC works closely with America for Early Ed to support advocacy and public policy in Arizona. We’re building on guidelines, frameworks, and standards that currently operate across programs, organizations and states. NAEYC’s Power to the Profession initiative aims to establish a shared framework of career pathways, knowledge and competencies, qualifications, standards, and compensation that unifies the entire profession. This will lead to a comprehensive policy and financing strategy for their systemic adoption and implementation. AzAEYC hosted Power to the Profession Dialogue Day to engage members on this very important and ongoing initiative.